2. Tin ceiling. I've wanted a golden ceiling in the RV for years. I love the contrast of the outside of the RV being cold and boring and the inside being warm and ornate, and a golden ceiling seemed like a perfect extension of that idea. More practically, all of the repositioning of lights and removal of the air conditioner had left the carpet ceiling ugly and scarred. I bought the panels (for Rialta owners, it can be done with 13 panels if you're super efficient, 14 if you're reasonably efficient) from American Tin Ceilings from a guy named Ken. He was very helpful and I really can't say enough good things about their company. There was a miscommunication through email that resulted in me getting the wrong color panels, and they sent me a new batch immediately. Unfortunately I didn't notice that the color was wrong until I spent fifteen hours installing the first ceiling. 3. Zebrawood desk/table. My friend Brian Sharp is really good at woodworking and has the exact same RV, so I headed up North to Seattle to visit and do RV projects. Thanks to his expertise, we built really nice desks for ourselves. I spend a lot of time at my desk, and my old one was really shoddy. It wobbled and flexed and had a seam in the middle that was a haven for crumbs. The lumber for my new desk cost less than $100, and it's really beautiful. Mercedes used to use the same wood for their interiors. 4. New curtains. Again thanks to Brian (and my mom for the one in the last video), I have better curtains in the RV. In the back I have a blackout curtain as well as a translucent curtain, and in the front I have the same. The Rialta came with a front curtain, but it was so tight that you couldn't recline the front seats. It also didn't go down to the floor, so you could see car interior. All of the side windows use day/night shades. You can buy these for hundreds of dollars from custom RV places, OR go to JC Penny and just buy premade ones there. I love that they can be translucent or black-out, but I don't love the look or the fact that they rattle when driving. One potential future project would be nice silk curtains in their place. 5. Projector setup. This is another one of those projects where I think, "Wouldn't it be cool if..." and next thing you know I've ordered a projector and some fabric for the screen. The projector is permanently mounted in the lower front-cab area of the RV. Wires are routed through the ceiling and the walls to put a power switch near the desk and HDMI cables going to a switch under the desk. With two flicks of a switch, the projector is on and my computer has shifted from the wall-mounted LCD to the projector. Long ago I installed a 12" JL subwoofer, new speakers, and an amplifier, so the experience of watching a movie on the projector is pretty great. The screen lets approximately 40% of the light through, so it's also possible to reverse the image and watch it from bed. 6. Vertical garden. I've gone through a lot of iterations of trying to have plants in the RV, and may have come up with a good solution (I've only had it for a week, so I'm not sure yet). Neva Starr makes these on Etsy and I bought one for the RV. What I love about it is that it doesn't take up any space on my counter and instead uses otherwise unused wall space. 7. Water Filter. I drink a lot of tea, and because tea is mostly water, the quality of the water you brew in makes a huge difference. I put in a giant residential-sized triple-stage water filter to purify water from a separate faucet on my counter. Before I had the filter I found myself not wanting to drink the RV water since it had been sitting in a plastic tank, but now it tastes great. 8. Cedar closet. Damn! I just realized that I forgot to put this in the video! I lined my closet with cedar because I had moths in here and everything I wear is wool. I wasn't sure if it would actually repel moths, but I did it anyway because it was easy and smells great. To my surprise, the moths disappeared instantly. I also used some extra cedar to line one of my drawers, so my socks and underwear smell cedary and are moth-free. That's the bulk of the upgrades. You'll see a couple more little things in the video, and I've probably forgotten a few as well. The RV has been comfortable and fun to live in since day one, but at this point I prefer it to anywhere else I could possibly live. Even when I park in front of the nice houses of friends and family, I always stay in the RV. 1. Wallpaper. This is low priority because the existing walls aren't bad (mottled white/pink/blue), but I think it would be cool to have some nice wallpaper or maybe really thin wood veneer up. 2. Better projector screen. See this post... I still haven't tried any of the suggestions, but I intend to, soon. 3. Better curtains on the sides. Right now I'm renting an amazing parking space, but that's about to end, so I'll be back on the street. I may use that as an opportunity to make some curtains that block 100% of the light from the inside and look nicer than my pull-down blinds. 4. Motorcycle Trailer-in-a-Bag. I actually bought one of these and we've tried it on my friend's Rialta (he has the same RV and motorcycle as me), but the trailer is in Texas and I'm in San Francisco (if you're driving this way... let me know). The TIB is a full motorcycle trailer that can carry my motorcycle across the US, but can also be folded up and stored under the bed. Really amazing. 5. New legs for the table. The ones I have now are crappy adjustable ones, but I'd like to get some nice wood ones and cut them to the perfect length. 6. Crown molding instead of the weird fabric thing on the side. I haven't quite figured out how I'll do this one, but I do have some ideas. 7. I have a weird plan to build a monitor into my wall instead of having it swing out on an arm. I haven't seriously done the work to see if it's possible, but I'll probably do it at some point. I may also get a Raspberry Pi (super low voltage computer) and build another screen for it into another wall panel, and use it to show the weather, maybe some security cameras, etc. Excessive, but fun just to do the project. By the way-- for those of you going to RSD's superconference next month, I'll be there, too. Come say hi. The point is, though, that the expression of your creativity and individuality is practical yet awesome: and very much admired. Well done! Thanks! I also see it as a practical expression of creativity, and I like being in an environment created like that. The LED lights are a very easy upgrade... definitely try that one and feel free to ask in the community section if you get stuck. To start, buy some strands of them on eBay. Tynan, your RV book is amazing! It really inspired me, and I pulled the trigger and bought one. I really looked long and hard at the Rialtas, but the inherent mechanical problems in an older vehicle swayed my decision. I eventually went for the Pleasure way Ascent TS, and would recommend it to anyone looking for a modern day substitute for the Rialta. It does have the 'walking through a hallway' effect described in your book, and a hefty price tag, but the sprinter diesel engine and drivetrain make it a contender. Thanks for sharing all the specifics regarding RV life. I like the size and ruggedness of a step van, but don't like the fuel economy. Snap On trucks are everywhere on craigslist and already have a generator, wiring, ac and heat. I'm both excited and daunted by the blank canvas aspect of converting a step van. If any of you have any websites that would be of help in constructing the interior systems, please send them along. I've like the step van idea, too, and was going to point you towards The Ultimate Roving Home blog until I saw it in your collection of links already. The plans for that one looked phenom - if you haven't noticed, his last post indicates he's selling what he started, so the van and the work he's done plus I think some of the parts he had already bought - could be a cool starting point for the right person. Fratire Writer at www.raulfelix.com, Motorcycle Traveler. I have a suggestion for you: when I get an e-mail update from you it says "To read the comments or see the post on the site, click here." That implies there is no more to the post. How about you include "the rest of the post". That way your readers who are slow on the upkeep will know there is more to it. I'll take a look at it, thanks. Wow, this is incredible. I'm working on replacing the curtains and redoing one of the interior panels but quickly running out of town. Definitely post pictures in the community section of any cool mods you do! I love what you've done with the place ... quite creative and "homey". One question for you. Do you rely exclusively on public bathroom facilities? Thanks! No, there's actually a bathroom in there. If you look at some of my older videos, you can see it. Actually, I replaced the toilet with a real porcelain one, but I forgot to include that in the video. Dude, you totally need to do pics/write up on the toilet swap!!! I would, but it's not really possible to get the toilet anymore. It was special made for some other RV and I happened to find a new one on ebay. The actual swap, if you can find a suitable toilet, is pretty basic. I'd still like to see pics/info, I'm 6'2" and the factory 'throne' makes me think I'd basically be sitting on the floor! I'm guessing the new one is taller, so make/model would be awesome for the hunt. I'm still a bit away from going nomad, but am doing as much planning as possible. Thanks! Mine's actually the same height. There are universal riser kits, though... look into those. You put together a pretty cool RV even for such a small RV. I loved the whole projector on a white sheet idea - hope you don't mind if I "Borrow" that idea someday. My wife and I are looking at going full time RV and I found your site from a link in an old Slashdot article. Hey Tynan, care to give some tips to a fellow Rialta dweller on the general rules of staying out of harm/LEO's way on the streets of SF? Do I need 100% blackout curtains, during nighttime? 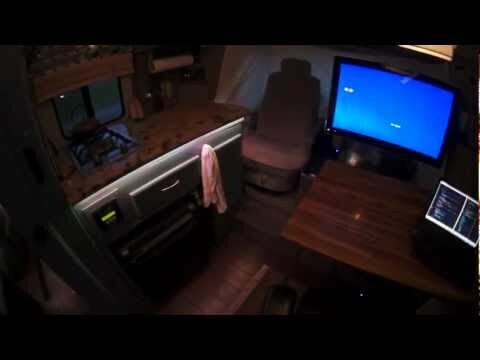 Is it OK to generally hang out in the RV during the day with the windows open, then crash in the same spot at night? How about leaving the window by the bed open at night, for breeze? Security risk? How about sound from music/laptop/you/etc leaking out onto the street (i.e. at night)? This gives me the most anxiety. I just bought a 96 Rialta but am sweating these final details before I push off into the streets of SF. Quite appreciative for any feedback! I am new to your site and found it be very useful. I read all your posts about your RV and have been thinking about doing something similar. I did a search on the model you recommend, but it is hard for find one for sale. The bluebook for that model is around $6K, but no one sells it at that price. Do you have any suggestions for me and how much money should I plan to invest in buying a comparable RV? I take long showers, or at least I used to before I lived in an RV. I always put the water a little too hot, then get in and face away from the shower because the water is too hot for my chest. Fifteen minutes later I realize that I've been staring into space while enjoying my vertical hot tub, and then finally start taking a shower. Yeah, it's not ecofriendly, but I'm making up for it now that all of my power comes from the sun. A quick little post today on my routine that I go through when I'm stuck. Let's say that I'm programming and I'm hitting a wall, maybe I'm getting frustrated that I can't figure something out, and I feel like I'm spinning my wheels. Despite being a supreme genius of the universe, this happens to me all the time. Now I have a little routine that I go through systematically, and eighty percent of the time or so it gets me moving again. The first thing I do is I clean up my desk. I hate to admit that I'm influenced by such trivial things as desk clutter, but a nice empty clean desk has a real calming effect on the mind. Sometimes I even wipe it down with soap and water so that it's really clean. This sounds a little bit crazy, but I've noticed a consistent improvement in motivation when I do it. I also clean anything in front of me. In the RV, that's the two front seats and whatever's on the kitchen counter beside me. Next I drink about sixteen ounces of water, even if I'm not thirsty. Left to my own devices, I drink very little water unless I'm at a restaurant, so I use frustration as a cue that I might need more water. Sometimes I have tea cold-brewing in the fridge, and I might drink that instead. Being even moderately dehydrated brings on feeling of fatigue, which can be confused with (or a part of) not being able to concentrate. Drinking water doesn't always have an effect, but sometimes it wakes me right up. After cleaning and drinking some water, I play my violin. You can substitute anything left-brained here, like sketching or playing piano. I have theories about why this helps-- maybe it spins up the left brain and starts using it to tackle the problem at hand, maybe it gives the right brain a break to recharge its chemicals, or maybe it's all placebo. Regardless, I find that a good portion of the time after I play some music, I'll think of a totally different solution to the problem that I hadn't even considered before.